Competition - Win Afternoon Tea For Two! Thank you to everyone who entered our Christmas competition. In fact, there were so many correct entries that we decided to award prizes to two entrants! 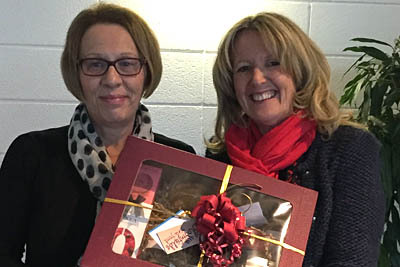 So, congratulations are due to Jan Sangster from TE Connectivity (pictured left with Jackie) and to Hazel Godden from Cleeve Technology. They correctly answered that Santa's reindeers, who are named after Thunder and Lighting, are called Donner and Blitzen! They both won fabulous Christmas Hampers from the award-winning Bloomfields Fine Foods. "How many faces does Janus, the Roman God, have... and why?" Email your answer and contact details to jackie@jackiekerrrecruitment.com and the lucky winner will be drawn from the correct answers on - good luck! Email your answer and contact details to jackie@jackiekerrrecruitment.com and the lucky winner will be drawn from the correct answers on Monday 30th January 2017 - good luck! What's up,I read your blog named "--" daily.Your story-telling style is awesome, keep it up! And you can look our website about تحميل اغانى 2017 http://www.aghanyna.com/arabic/archives/tag/%d8%aa%d8%ad%d9%85%d9%8a%d9%84-%d8%a7%d8%ba%d8%a7%d9%86%d9%89-%d9%a2%d9%a0%d9%a1%d9%a7. Hi,I read your blog named "--" regularly.Your story-telling style is awesome, keep up the good work! And you can look our website about تحميل اغانى 2017 http://www.aghanyna.com/arabic/archives/tag/%d8%aa%d8%ad%d9%85%d9%8a%d9%84-%d8%a7%d8%ba%d8%a7%d9%86%d9%89-%d9%a2%d9%a0%d9%a1%d9%a7. Hi there,I read your blog named "--" daily.Your story-telling style is witty, keep up the good work! And you can look our website about اغانى جديدة http://www.aghanyna.com/arabic/songs/latest. Hello,I log on to your new stuff named "--" daily.Your humoristic style is awesome, keep up the good work! And you can look our website about اغانى جديدة 2017 http://www.aghanyna.com/arabic/archives/tag/%d8%a7%d8%ba%d8%a7%d9%86%d9%89-%d8%b9%d8%b1%d8%a8%d9%89-%d9%a2%d9%a0%d9%a1%d9%a7. Hi,I log on to your blog named "--" on a regular basis.Your story-telling style is witty, keep doing what you're doing! And you can look our website about how to plan my wedding http://www.wedding0venues.tk/. What's up,I read your blogs named "--" like every week.Your humoristic style is witty, keep doing what you're doing! And you can look our website about تحميل اغانى http://www.aghanyna.com/arabic/. What's up,I log on to your blogs named "--" on a regular basis.Your humoristic style is witty, keep doing what you're doing! And you can look our website about تحميل اغانى http://www.aghanyna.com/arabic/. Hi there,I check your new stuff named "--" on a regular basis.Your humoristic style is witty, keep it up! And you can look our website about how to plan my wedding http://www.wedding0venues.tk/.